Pantone’s colourful journey started in 1962. Since its very inception, Pantone is working relentlessly for a standardised colour production system. Every year fashion, design and interior décor world wait with bated breath for the company to announce the Colour of the Year and set the trend for the upcoming season. Call it a fashion or fad, embracing Pantone’s top 10 colours is a sure way of giving your home a trendy makeover. This year Pantone top 10 swatches include those colours that help represent the more vibrant and wittier you. Colours have an indisputable impact on our psyche. It can affect our lives in more ways than one. The powerful connection between colours and our lives is acknowledged for ages and reflects in the traditional beliefs. We find colours rich with symbolical meanings. If this sounds overly metaphysical, just think of red, yellow and green of a traffic signal. You will find out for yourself that how deeply colours impact your life. It is unlikely that you will wish to incorporate all ten colours in your home. It is better to plan your interior around a central theme. So choose the one that seems best suited for your home. Though considered the trendsetting colours of the season, you will find out many of these are perennial favourites. With any one of these, your home will not look dressed up for one season only. This year, instead of one, Pantone chose two hues as the Colours of 2016. Rose quartz is one of them. Rose quartz in its crystal form stands for unconditional love. Despite its widespread availability, it is also one of the most coveted crystals of the world. Its soft pink colour has a loving effect on mind. It also invokes an admiration of pure beauty. This very colour, which seems so adorable for jewellery makes it an awkward choice for the interior of a home. That is, unless you are decorating a home with a pronounced feminine tone or designing your kid’s room. So, most people will be satisfied in using it as an accent colour only. However, this home chose a different route. 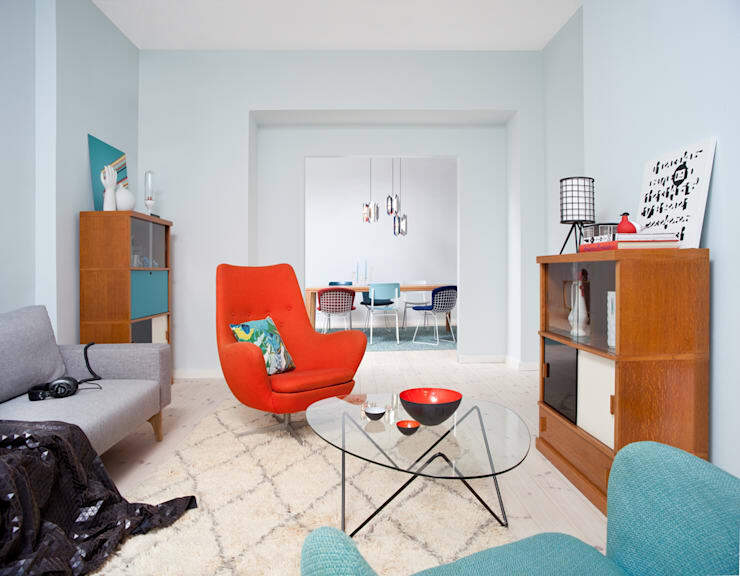 It selected a sofa in pinkish hue, but subdued the gloss by selecting a matte cotton fabric. This is also offset by the blue wall as well as the black and white rug. While peach blossom signifies good fortune, peach fruit is steeped with the wishes of a long and healthy life. The tree itself is considered to be sacred and appears frequently in Asian art. The Chinese Year of Monkey, to be celebrated early in 2016, also has a strong bond with the peaches. Not only does monkey love its peaches but together they try to bestow healthier and happier life on those who astrologically belong to the Year of Monkey. 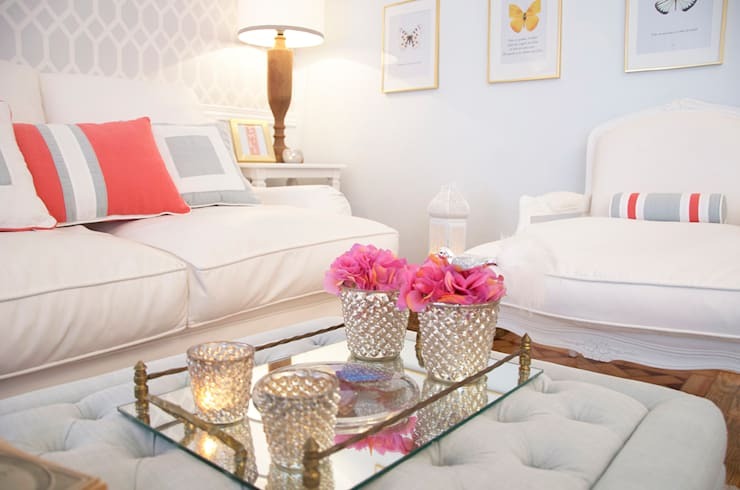 But this lovely colour poses similar challenges as those of rose quartz when trying to incorporate in interior décor. In spite of this, you can always choose a pair of peachy cushions to spice up your monochromatic sofa. Place an area rug in peach and white tone or a dazzling bunch of peach coloured chrysanthemum, rose, carnation or gerbera to usher a peachy season. Pantone’s second colour of the year for 2016 is “serenity”, a perfect company to rose quartz balancing the yin with yang. Pale blue shades always have a calming effect on mind. The clear blue face of sky promises a smiling day ahead. Blue is also supposed to inspire spiritual growth. The colour which has such peaceful effects on mind can also be depressive if not properly balanced with slightly warmer or neutral tones. 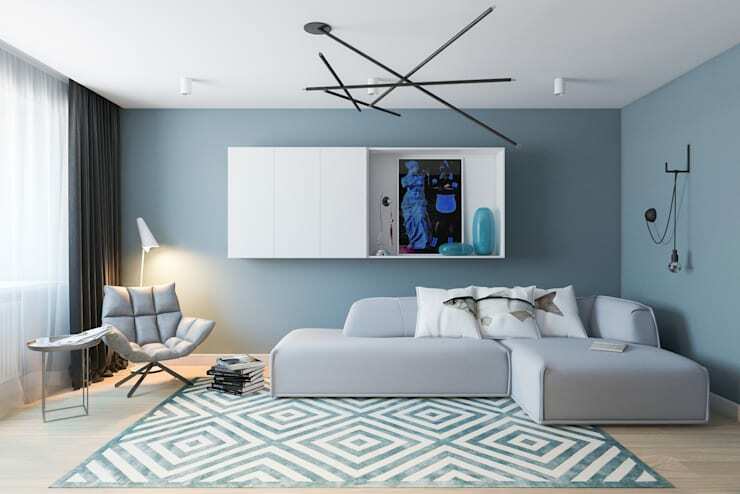 People from colder countries can find their interiors gloomy with over application of “serenity.” When used smartly like in this apartment designed by Alena Bulat it gives spectacular results. This is the second colour of Pantone Top 10 that belongs to the blue family. Consider it closer to the shade of lapis lazuli, sans its intensity. Artists seem to share a particular passion for the intense blue shades. From Giotto’s fresco in Padua’s Scrovegni Chapel to Henri Matisse’s Die Blaue Frau, great works of art are replete with such instances. Once again the intensity of snorkel blue requires support from neutral or bright colours to make it suitable for our homes. It is an even darker shade so remember to use brighter lighting to make the ambience cheerful. 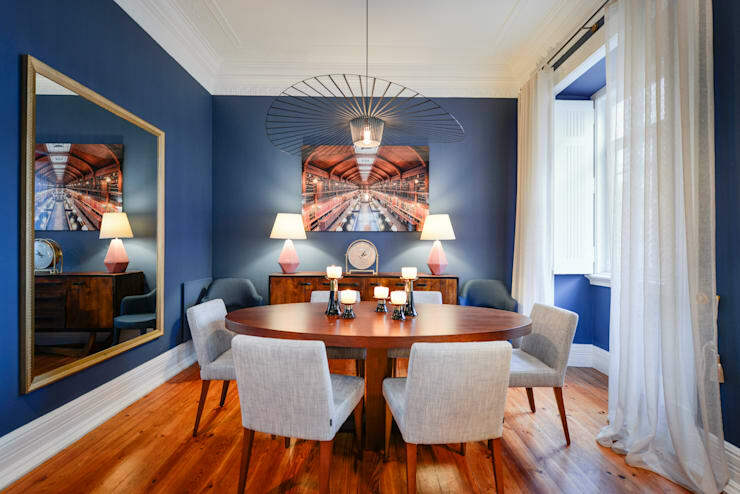 This dinner room perfectly matches the dark blue shade with the dark wood dining table. The vivacity of yellow finds its full expression through buttercup. The luminosity of yellow is associated with wisdom, happiness and glory. Indian astrology believes in the power of yellow and associates it with the biggest planet of solar system, Jupiter. Yellow sapphire is highly regarded for its beauty and metaphysical values. Though sunny in nature, staying in an all yellow room seems to be inconceivable. A bright buttercup requires a mellower partner either from yellow or other neutral family of colours. 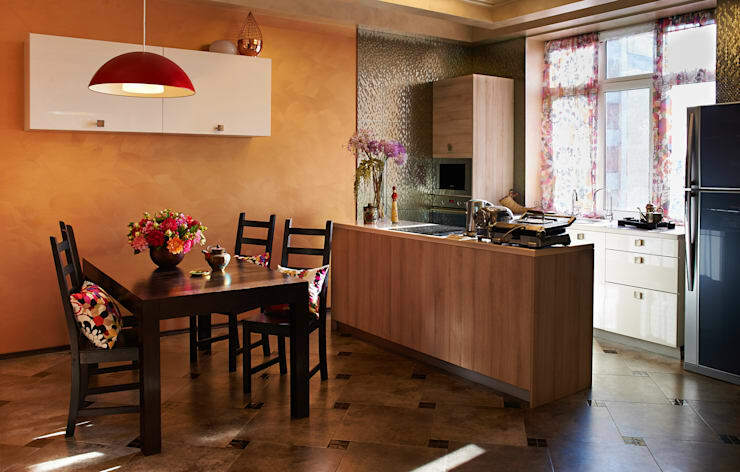 This however acts as a great accent tone and when used skilfully cheers up the interiors in no time. 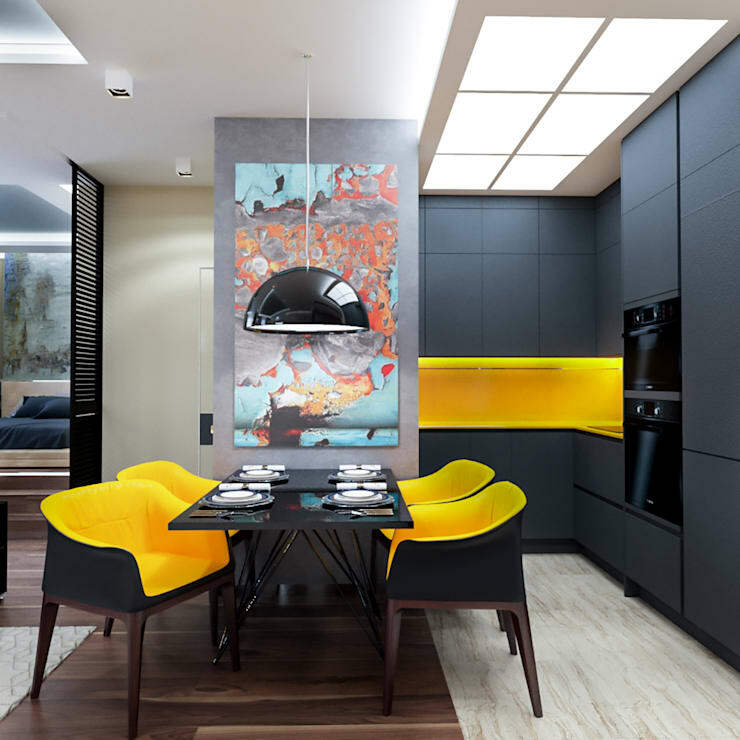 Small apartments can choose yellow to make their interior both brighter and roomier. Limpet Shell is softest of all three blues chosen by Pantone. Limpet, a particular mollusc which bears no coil, holds this shade close to its bosom. This colour also resonates with the calm waves of Caribbean Sea. The tenderness of limpet shell makes it a great choice for bedroom walls, soft furnishings and rugs. 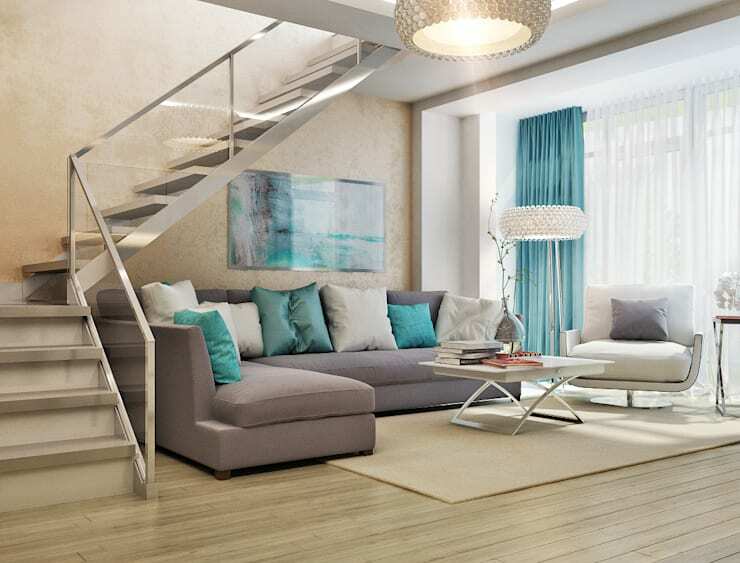 Unlike other shades of blue, this exudes a calmness without any depressive tendency. It also proves to be an apt accompaniment for such hot colours as buttercup. Lilac grey exudes a rosier and more cheerful vibe than normal light grey. Though smoky in shade it is tinged with the pale violet tone of lilac. So, despite being transitional between black and white, it produces a more luxurious effect. Metaphysically, lilac is believed to promote intuitive capabilities. Paired with grey it will produce an elegant interior without making it look grim. Lilac grey is such a versatile colour that it can be used almost anywhere in a home. The predominance of grey should be balanced with richer shades however. A few bright cushions, rug, wall painting or decorative elements should be enough to create a soothing ambient with the help of lilac grey. Fiesta boasts of all the exuberance of Mexican chilly red sans its excitability. Even being of orange red family it remains somewhat subdued. Red as a colour stands for passion. Think of red hot mars and you would understand why. Red is also believed to be a harbinger of good luck which explains its widespread use in ancient cultures. Fiesta can be a great addition to your home if you combine it with such colours as lilac grey or serenity. A statement couch, ravishing fiesta dining table runner, table or pendant lamp shade, wall art or kitchen stools will amply showcase the bolder and brighter you. Iced coffee’s earthen face helps to compensate the ebullience of such colours as fiesta. In the interiors of your home, natural wood would best convey the moods of iced coffee. This organic element has its own grounding effect. Such colours as iced coffee bring stability in life and increases harmony between the members of a family. It makes us more practical and well rounded individuals. Use iced coffee in your kitchen. Deck up the accent wall of your living room with this tone. You can even use iced coffee in the exterior of your house. 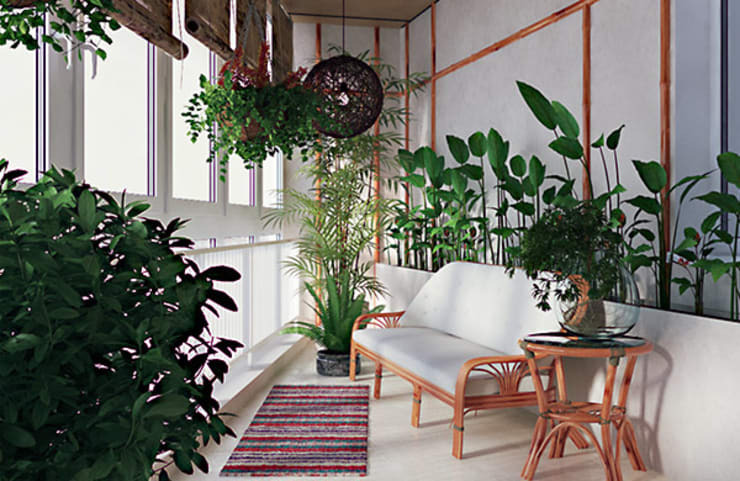 Embellish the rooms with green plants and colourful flowers. When used on the outer walls balance it off with white or terracotta red shades. It is best to trust the natural elements to soak your room in green flash. With this you will not have to worry about offsetting the rather flashier part of green flash. Green is associated with growth and regeneration. It is also a colour of wisdom and is associated with planet mercury. Green soothes our eyes and minds. It also reduces stress. That is why a trip to a lush green garden or woods always makes us feel invigorated. Try to have potted plants in almost every part of the house. You can even use bonsai to decorate your home. But shy away from cactus and creepers for the interiors. Flowering plants will produce an extra dash of colour too and you will have your own spiritual retreat right inside your home. See how this home has created a peaceful abode in the lap of nature.